The active class list represents classes that have raced in the most recent indoor season. Dirt Runners R/C Car Club provides the opportunity to race all classes listed below, but cannot control the number of entries into any class. Any classes that falls short of 5 entries may be ran at the race directors discretion, that decision will be made based on total entries and heat count on race day. Furthermore, entrants in a class with less than 5 entries may move into a similar class of competition. The entrant may request to move to a different class but must be agreed to by the drivers of said class. The entrant may also decide to withdrawal from competition and receive a refund. This class is for entry-level drivers (first year drivers, and children under 13, etc.). Both cars and trucks will be permitted to race in this class (**2wd ONLY!!!**). As driving skill becomes evident, these drivers will be graduated to more advanced classes. No age limit. No weight restrictions. 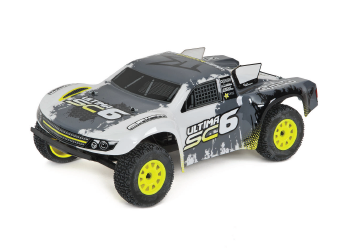 Typical types of vehicles in this class are 2wd electric trucks and buggies or Traxxas Slash, 1/10 scale electric 2wd pan cars. If it’s not mentioned in the following rules, it is illegal. 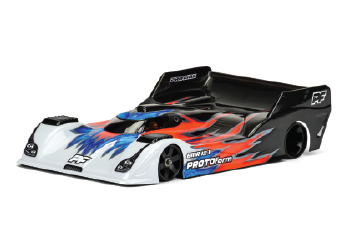 Chassis: Any Chassis that is manufactured for R/C racing that retains its original configuration. The car/truck must conform to stock class associated with that vehicle. Motor: ROAR approved 27T stock, 17.5 brushless or 12 Turn Traxxas Titan motor only. Batteries: NiMH or 2C Lipo Hard Case Batteries. Speed Control: Any speed control system that does not have adjustable timing (brushless), and does not cause radio interference. TSM: TSM is REQUIRED to be OFF. TSM is not allowed. Steering: Rods, servo-mounts, etc. may be replaced with aftermarket equipment in the interest of durability. Transmission: Standard gear reduction transmission and stock gears, provided with the kit. No 2 speeds. Wheels/Tires: Any over-the-counter available wheels/tires (exception: no dual wheels, no pins). Bodies: Any body in scale to the vehicle/chassis (exception: no wedge bodies in any class). Ball Bearings: Allowed (no motor bearings). Air Dams: No side dams. Rear spoiler allowed, it may not exceed the width of the body and may not extend more than 2 1/2″ past rear of body. Front: Also not to exceed width of body, or extend more than 2 1/2″ in front of body. ABILITY IS KING, YOU HAVE FOUND THE RIGHT DIVISION. 12T STOCK MUDBOSS SPECIFC RULES ARE HIGHLIGHTED IN RED, WE RUN BOTH CLASSES. 1 Salvas MudBoss body only (2014, 2015, 2016 and 2017 version) ONLY! 3.3.1 – TRAXXAS 2075x (servo) AND TRAXXAS 2072x (gears) are allowed as ‘alternative’ parts/servo. 3.4 – it is allowed to ‘pin’ the servo saver(white) or bell crank(black)…be advised the servo gears might get broken under a heavy crash!!! 3.4.2 – It is allowed to use a solid (one piece) servo horn of any brand. 1/10th Open Oval is a “Run-What-Ya-Brung” breakout class with the breakout time set at 4.5 seconds. Basic battery rules apply. Roar approved 6 or 7 cell sub C battery pack, 2S+ Hard Cased LiPo battery or LiFeO4 Battery see general rules, batteries (April 2010). Soft case Traxxas lipo batteries must be presented for inspection before use on the track. You’re limited on speed, so a 1s or 2s battery should do it for you, depending on the car. The only true rules for Open Oval are: the car must be 1/10th scale (or smaller) and no bigger in overall length and width than a Short Course Truck. You can’t maim or injure anyone with your car! 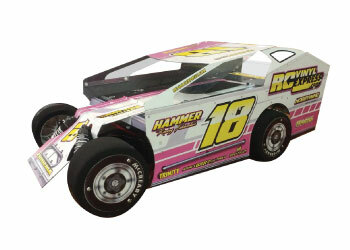 This class is for racer wishing to run a stock 1/10 scale 2wd pan car. The intent of this class is to have close racing without the heavy price tag. No need to have the latest greatest equipment to be competitive. Any lap 3.5 seconds or faster does not count. Batteries: ROAR approved 1S LiPO battery. Suspension: Aftermarket replacement parts allowed. Steering: Aftermarket replacement parts allowed. Transmission: Any 1/10th direct drive. Wheels/Tires: Any wheels/tires specifically designed for 1/l0th scale pan cars. Bodies: Nascar style body. Back of the body must be left in. Air Dams: No side dams allowed. Spoiler: Rear spoiler must be stock to the body. 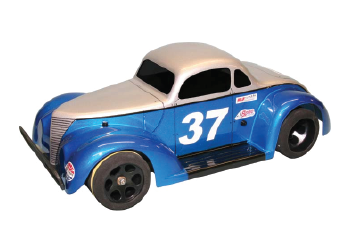 This class is for racer wishing to run an 1/10 scale Bolink/RJ Speed legends car. Chassis: Bolink Legends or RJ Speed chassis only. Chassis weights are allowed. Motor: Any ROAR approved 17.5 spec motor to be allowed. Specifically NOT allowed are the Trinity D3.5 and Vulcan Outlaw motors or any other outlaw variants. (Any ROAR approved 27 turn brushed motor still allowed) (10/2014). Batteries: Any ROAR approved 4 cell NiMH (to be run with 27T motor) or 1C hard cased lipo (to be ran with 17.5 motor). Suspension: Original kit only, no modifications and no aftermarket parts allowed except the use of a king pin brace and any rate front spring. Steering: Original kit only, no modifications and no aftermarket parts allowed. Steering turnbuckles can be updated. **Associated 12th scale steering blocks or similar are allowed. Transmission: Pro-Diff setup is allowed, with a maximum diff side distance of 1.12″ from the chassis to the inside of the tire when mounted on the hub. E.G. No offset rims allowed, this distance was determined from a street spec diff setup with standard hub, with a small allowance (.1″) for shims etc (10/2014). Spur/pinion gear ratio open. Wheels/Tires: Yellow Stripe, Purple Stripe, or any WGT spec tire only. Bodies: Legends body only. Window cutouts allowed. This class is intended for racers looking to compete in close, cost controlled racing, with realistic looking trucks. 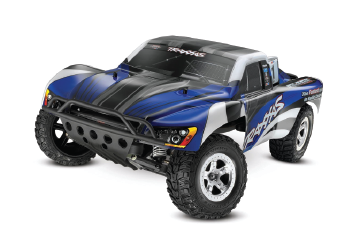 Base Vehicle: Traxxas Slash 2WD. Chassis/Components: Box Stock. RPM Rear Bumper Mount may be used (RPM 80902 (Black) and 80905 (Blue)) as well as the RPM Gear Cover (RPM 80525 (Blue) and 80522 (Black)), no other modifications or alternate parts are allowed unless specifically stated in the remainder of the SLASH rules. 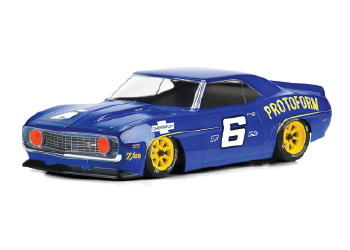 Ride Height: Body on , battery in , ready to run: Dropped one foot a 2-3/8“ minimum ride height at center of chassis. Body Clips: Any standard r/c body clip may be used (locking or regular). Motor: Traxxas 3785 motor only, as per supplied with kit. Comm drops are not permitted. Batteries: Roar approved 6 or 7 cell sub C battery pack, 2S Hard Cased LiPo battery or LiFeO4 Battery. See general rules, batteries. Soft case Traxxas lipo batteries must be presented for inspection before use on the track. Battery/Motor Connectors: Any allowed, not restricted to stock connectors. Speed Control: Traxxas 3018X XL-5 speed control only (as supplied with the kit). Radio/Receiver: Any ROAR allowed Radio/Receiver Combination is permitted, e.g. you may switch the receiver and transmitter from the units supplied with the vehicle. Suspension: Must remain stock, the only alternate part allowed is the use of aluminum shock caps (Traxxas 2667) and the use of any silicone shock oil. No Modifications or alternate parts allowed otherwise, e.g. no additional shock limiters (only stock configuration allowed), shortening of springs or drilling/filling of shock pistons. Steering: Stock components only, no changes allowed. Transmission: Stock transmission in box stock configuration only (Only grease may be used in any part of the transmission (including the differential), Silicone is specifically not allowed). Pinion gears are restricted to the 4 sizes (16T, 18T, 19T and 23T, 48 pitch any manufacturer)(updated January 2018). Spur Gear is limited to the 86T and 90T (April 2010) 48 pitch spur gear as supplied with the vehicle (Traxxas 4686/5803) only. Windows are not required to be left clear. Paint scheme is up to the individual. Scale realism is encouraged. Ball Bearings: Allowed (as per supplied with kit). No ceramic bearings and/or hybrid bearings allowed. Other manufacturers bearings are permitted. Transponder: Personal Transponders are permitted and can be mounted anywhere on the vehicle that the owner sees fit. 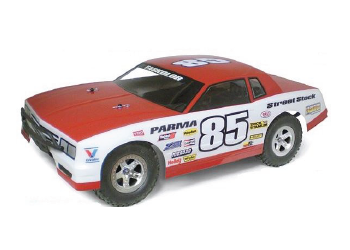 This class is for racer wishing to run a 1/12 scale 2wd pan car on a road course. Batteries: ROAR approved 1S LiPoâ€“ see general rules, batteries (March 2008). Transmission: Any 1/12th direct drive. Wheels/Tires: Any wheels/tires specifically designed for 1/l2th scale pan cars. Spoiler: Not Allowed e.g. no lightening of plastic mounting pieces. 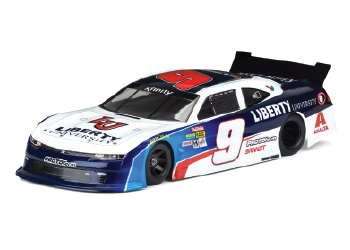 Front â€œscoopâ€� on hood may be cut out for cooling, driver’s helmet may also be cut out for cooling. Flat section below helmet also can be trimmed, no other holes and/or modifications allowed to body. Front and rear wings must be run at all times. Transmitter/Receiver: Any transmitter/receiver may be used. Chassis/Components: Box Stock. No modifications or alternate parts are allowed unless specifically stated in the remainder of the 4TEC Spec rules. 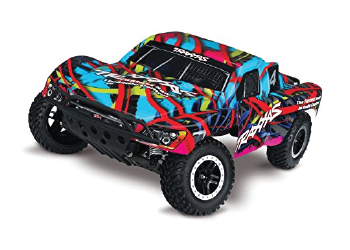 Motor: Traxxas 3785 motor only, as per supplied with kit. Comm drops are not permitted. Note: this class has a motor claim rule. For the cost of a new replacement motor plus $10, any motor raced during the event may be purchased out of any car entered into the race. At time of purchase, the motor will be tagged. A race official will hold the money for purchase and the transaction will take place at the end of the main for the night’s race. Batteries: Roar approved 6 or 7 cell sub C battery pack, 2S Hard Cased LiPo battery. Soft case Traxxas lipo batteries must be presented for inspection before use on the track. Battery/Motor Connectors: Any battery connector allowed, not restricted to stock connectors. Motor Connectors must remain stock (as supplied with kit). Servo: Traxxas 2075(original kit servo), 2075x (TRA2075X), 2075x metal gear kit (TRA2072X), Savox SC0251MG Metal Gear Set (SAV-SG-SC0251MG) servo/gears only, to be used with the stock servo saver ONLY. Camber and steering linkages: Must remain box stock. No adjustable links allowed. Transmission: Stock transmission in box stock configuration only. Pinion gears are restricted to the box stock options (21T, 25T). Spur Gear is limited to the box stock spur gear(70T) as supplied with the kit. Diffs are required to be used in box stock configuration, including stock silicone. Wheels/Tires: Limited to the tires and rims that come stock with the kit only (part numbers #8373 — Front ; #8374 — Rear). Traction compound is allowed prior to race, but not to be used to soften tires further (e.g. soaking). No additives/compounds/fluids or any other method may be used to soften the tires. Removal of the calipers is optional, as they might get displaced during a race. The stock wheel hexes are MANDATORY as they fit the realistic look this class was designed off of. Bodies: Only closed-wheel realistic 4tec/190mm/200mm bodies are allowed. VTA approved (see body list ), Stock Traxxas bodies (Mustang and Ford GT and Future Traxxas designs), and Any body on the USGT body list (see body list ) Any other body (Drift, etc.) needs to be approved by the club. **KEEP IN MIND, Not all 190MM bodies fit on the 4Tec. Please purchase accordingly. Recommended bodies are 200MM** NO BITTYDESIGN and NO LIGHTWEIGHT ProtoFORM Bodies. NO Trucks vans minivans school buses garbage trucks, utility vehicles, moon landers, zambonis,golf carts, quads, etc allowed. No World GT bodies. Ball Bearings: Allowed (as per supplied with kit) **No ceramic bearings and/or hybrid bearings allowed**. Other manufacturers bearings are permitted. Spoiler: Not allowed other than the one that comes with the body. Transponder: Personal Transponders are permitted and can be mounted anywhere on the vehicle that the owner sees fit. Must be within the chassis. LiPo Cut-Off/Warning: The use of a LiPo cut-off / warning alarm is allowed as long as there is no performance gain associated with the device. If​​ ​​it’s​​ ​​not​​ ​​in​​ ​​the​​ ​​rules,​​ ​​and​​ ​​does​​ ​​not​​ ​​encompass​​ ​​the​​ ​​spirit​​ ​​of slower, controlled​​ ​​racing​​ ​​with​​ ​​realistic​​ ​​looking​​ ​​cars,​​ ​​consider​​ ​​it​​ ​​illegal.​​ ​​This​​ ​​is​​ ​​called​​ ​​the​​ ​​”Spirit​​ ​​of VTA”​​ ​​Rule. The​ ​class​ ​is​ ​based​ ​on​ ​slower,​ ​equal​ ​playing​ ​field​ ​competition​ ​with​ ​less​ ​traction,​ ​minimal aerodynamic​ ​aids​ ​and​ ​mostly​ ​older​ ​carpet​ ​racing​ ​technology.​ ​The​ ​final​ ​objective​ ​is​ ​close,​ ​fair, wheel-to-wheel​ ​racing​ ​for​ ​all. All​​ ​​decisions​​ ​​of​​ ​​the​​ ​​race​​ ​​promoter​​ ​​or​​ ​​track​​ ​​owner​​ ​​are​​ ​​final. 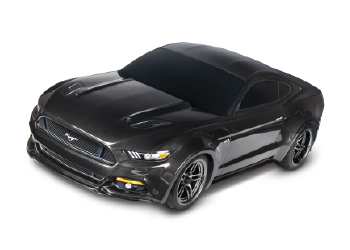 For the HPI, Bolink/RJ Speed Mustangs and McAllister Cougar which are not provided with a spoiler: A lexan spoiler of 16mm total height from trunk deck, and overall chord of 20mm is allowable. All other bodies must use the spoiler included with that specific body set. Built in spoilers may not be enhanced. .
No additional skirts or raised/extended wings or air control surfaces allowed unless specified by these rules. Body must be trimmed at body trim lines. Front spoiler may be extended into body to provide durability. Full rear bumper required. It is highly preferred that bodies are detailed in race type livery in period-correct paint schemes. Fluorescent colors, wild graphics, chromes and non-period correct paint schemes are frowned upon. All cars must have a number on the hood, both doors and trunk lid. Wheel covers of any type are NOT allowed. Batteries: ROAR​ ​approved​ ​7.4v​ ​2cell​ ​LiPo​ ​hard​ ​cased,​ ​6000mAh​ ​MAX​ ​limit. Speed Control: ANY​ ​ESC​ ​that​ ​is​ ​ROAR​ ​approved​ ​and​ ​using​ ​ROAR​ ​approved​ ​“Blinky”​ ​spec​ ​software​. Ride​​ ​​Height​​ ​​Specification: Minimum​ ​ride​ ​height​ ​is​ ​5mm. Weight​​ ​​Specification: Minimum​ ​1450g​ ​in​ ​race-ready​ ​trim. This class is intended for racers looking to compete in close, cost controlled racing, with realistic looking fwd Mini Coopers. 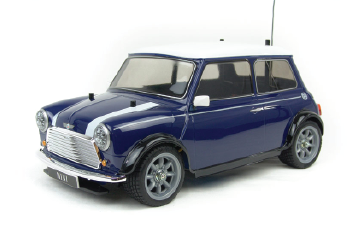 Base Vehicle: Tamiya M03, M04 or M05 Mini Cooper, any length wheelbase. Pro versions are specifically not allowed. Chassis/Components: Vehicle must remain box stock, no hop ups allowed. Motor: Tamiya 540-J motor (53689), or as supplied with official tamiya kit, RS-540 Torque Tuned Motor (Item 54358) is allowed. Batteries: Roar approved 6 cell sub C battery pack, 2S Hard Cased LiPo battery or LiFeO4 Batteryâ€“ see general rules, batteries. The use of LIPO and LiFeO4 batteries are permitted in this class, but due to the battery compartment having a rounded profile, the only legal packs for this class must have a rounded hard case. I.E. Orion/Peak 2400, 3200, and 3400 Carbon Edition hard cased batteries, Reedy 2400 and 3400 stick LIPOs. Modifying the M-chassis to fit other hard case LIPO batteries is not permitted. Note: New batteries released in the future that have a rounded hard case and have larger capacities will be permitted. There is no mAH or C rating limit. All Lipoâ€™s must be 7.4 Volt 2S-1P configurations. Suspension: Must remain stock. No Modifications or alternate parts allowed otherwise, e.g. no shock limiters, shortening of springs or drilling/filling of shock pistons. Transmission: Stock transmission in box stock configuration only (Only grease may be used in any part of the transmission). Pinion and spur gear combinations are limited to box stock configuration. Wheels/Tires: Tamiya 60D tires and wheels (50683, 50684, 53254 and 53340). Electrical tape may be used on tires. Traction additive is also allowed on tires. Sweeps Racing Mini Rubber tires are allowed. Ball Bearings: Allowed – no ceramic bearings and/or hybrid bearings allowed â€“ other manufacturers bearings are permitted. Transponder: Personnel Transponders are permitted and can be mounted anywhere on the vehicle that the owner sees fit. Club transponders are also available for use (mounted with a 1/4″ hole through the body (see general rules for transponder information). Inactive classes may be resurrected if 5 or more entries are present for a race day. Running of additional classes need to be approved by the race director prior to race day. Most indoor classes that are inactive were based on specific wind brush motors and have been deprecated from the list entirely. If you are interested in running a class that does not exist on either list, please contact the race director. RULES ARE SIMPLE: This class is an ANYTHING GOES race, where crashes are big and loud, and the name of the game is SURVIVAL! Any 1/10 2wd car is eligible to run. Slash is the most popular car for this race.